…Officers milled among themselves, sipping YucaBean or swiping away virt after virt of logs. Soon this would be just another case number in the immense NAPD backlog. 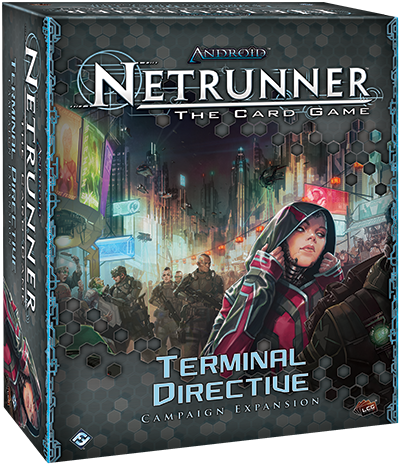 __Logged as ADN42: TERMINAL DIRECTIVE, this campaign expansion for Android: Netrunner promises to introduce a whole new dimension to the game's cat-and-mouse cyberstruggles—as well as its depiction of the larger Android universe. In fact, early reports suggest there's even MORE to the expansion than initially suspected. The first previews focused on how the campaign functions and how your standard games may benefit from the expansion's tournament-legal, 163 corp and runner cards (including four identities and a complete playset of fifty-three other cards). But there's more to a game than rules. And the expansion's player cards do far more than just splash some drops into the larger card pool. Terminal Directive offers a whole new PLAY EXPERIENCE. And we look forward to sharing that experience with you through a special Terminal Directive RELEASE EVENT. // Query: What does it feel like to play through the Terminal Directive campaign? The Terminal Directive campaign is designed for two players—one Corp and one Runner. You and your opponent select your IDs at the beginning of the campaign and must stick to those identities throughout. You must choose your ID from one of the four provided in the box. The campaign then weaves your games of Android: Netrunner into a larger meta layer of progressive narrative. The results of your games will have ongoing CONSEQUENCES. You will be forced to make DECISIONS between your games. Those decisions will also have consequences. As the campaign EVOLVES, new options will become available to you, even as others are sealed off forever. While this information is all fine and good, it doesn't entirely connect to the actual experience of the campaign. It gives the shape of it, but just as every good runner can tell you, you can't say what you'll experience while hacking into a corporate server based solely upon the number of ice and the assets, agendas, and/or upgrades at its root. :: A hands-on IMMERSION into and exploration of the vibrant ANDROID UNIVERSE. 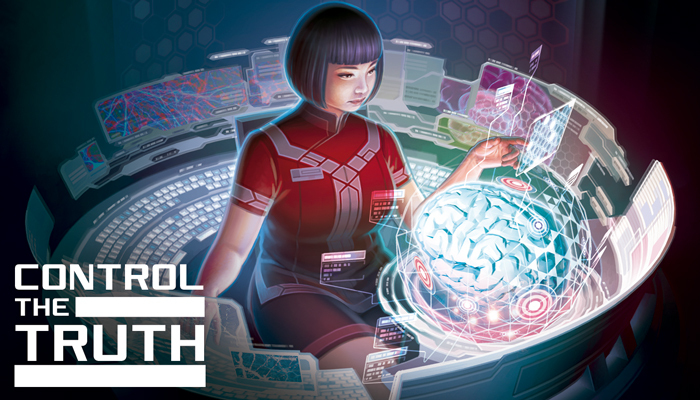 Fans of Android: Netrunner have long expressed their appreciation for its setting and the ways that its identities, artwork, and flavor text help them imagine their way into a world full of diverse characters and stories. And story resides at the heart of the Terminal Directive campaign. You get to be a part of it. You get to influence it. You get to see it realized in full, built up around you. :: EVOLUTION in its most basic and demanding form. Not only do you find new twists and turns among the sealed campaign cards you open and the stickers you use to alter your pad and cards, but you'll find yourself thrust into a dynamic, two-player meta. While you must stick with the ID you choose at the beginning of the campaign, nearly every other part of your deck can evolve. And even if you adhere to the campaign's recommended use of a single Core Set and Terminal Directive, you'll find enough material to react to your opponent's deck and shift your own strategy to leave her guessing what you might do next. 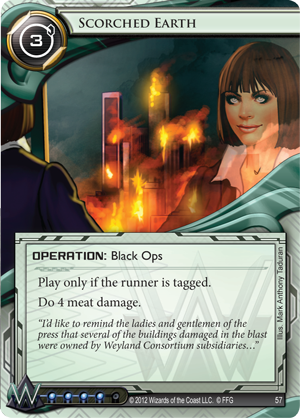 As an example, you might play through the campaign as Weyland, starting out with a "kill" deck built around tagging the runner and then flatlining him with Scorched Earth (Core Set, 99). But as your opponent learns to fear the retaliatory meat damage, you might quietly slip Scorched Earth out of the deck in favor of other traps or cards that focus on quickly advancing your agendas. :: Forced CREATIVITY. While newer players may revel in the many, many options Terminal Directive adds to their deck-builds and strategies, veteran players (who play the campaign according to recommendations) will find themselves forced to adapt their strategies to a more limited card pool. 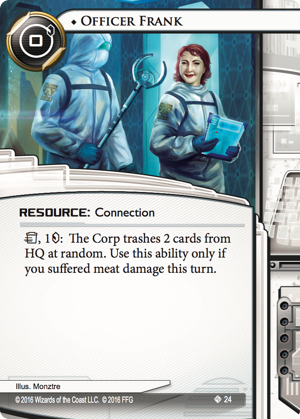 In this light, both the Core Set cards and Terminal Directive player cards find new uses, and creative players will find many ways to enjoy and exploit cards like OFFICER FRANK (Terminal Directive, 4) and ELI 2.0 (Terminal Directive, 34). :: You define your PERSONALITY. The decisions you make about your ethos—whether you are Protector or Predator—impact your games and shape your experience. But while you're free to pursue whichever ethos seems most appropriate at a given moment, the more you go in on a given ethos, the more fully it defines you and the stronger the impact upon your matches. And while you'll uncover many of the campaign's secrets the first time you play it, there's plenty of reason to REVISIT it for multiple plays. First of all, the campaign's twists aren't just narrative; they introduce NEW MECHANICS that alter your play experience—adding drama to the campaign, even if you know they're coming. Additionally, each faction and identity brings its own strengths to the campaign and offers its own experience. You can pursue different ethos effects. And you might enjoy how the campaign encourages you and your friend to keep TINKERING and EXPERIMENTING with your decks and strategies. Terminal Directive adds a new campaign dynamic to the previous duality of casual and competitive play. And as it does so, we're CELEBRATING the expansion's release with a special Terminal Directive release event. Open to retailers around the world, this Terminal Directive event takes you straight to the SCENE of the crime, where you can explore the expansion's narrative campaign and WIN EXCLUSIVE PRIZES simply for participating. Whether you run as a rogue operative or bring a friend, this Terminal Directive event promises you a memorable and unique gaming experience in the Android universe. All you need is a Core Set and Terminal Directive. Once you sign up, you'll receive a set of double-sided, FULL-BLEED promotional ID cards—one each for Runner and Corp—as well as a double-sided DIRECTIVE card for use in the event. 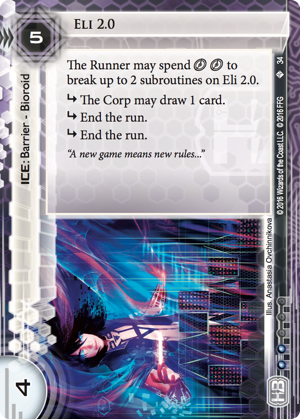 You'll be given time to build a pair of decks, and then you'll be paired with an opponent and thrown into the campaign's narrative Android: Netrunner game experience. You'll play four games with your opponent, evolving your deck between rounds and according to the choices made during your campaign. Throughout the event, you'll use your Directive card to record each OBJECTIVE toward which you make progress. If you're skilled or lucky enough to complete an objective over the course of your games, you may earn an exclusive EXTENDED ART version of ELI 2.0 or CHARLATAN. These extended art cards are exclusive to the Terminal Directive Event, and you can earn up to three copies of each card by completing ALL your objectives. And if you don't think you can complete all your objectives in just four games? Well, you'll be able to pursue any unfinished objectives when you flip from Runner to Corp (or from Corp to Runner) and play four more games, exploring the campaign's mysteries from another point of view. From all the BLUFFING that surrounds a single run to the strategic placement of facedown Corp cards to the ongoing evolution of the Terminal Directive murder mystery, Android: Netrunner carries you through layers upon layers of intrigue. It's one of the reasons the game has distinguished itself among fans and critics. 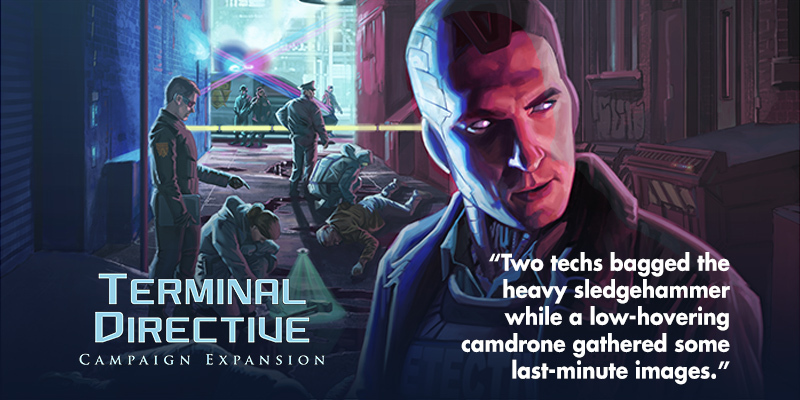 And there's no better time to start exploring all that the game has to offer than with the upcoming release of Terminal Directive. The NAPD won't keep their case file open for long. You'll want to start your investigation as soon as possible. 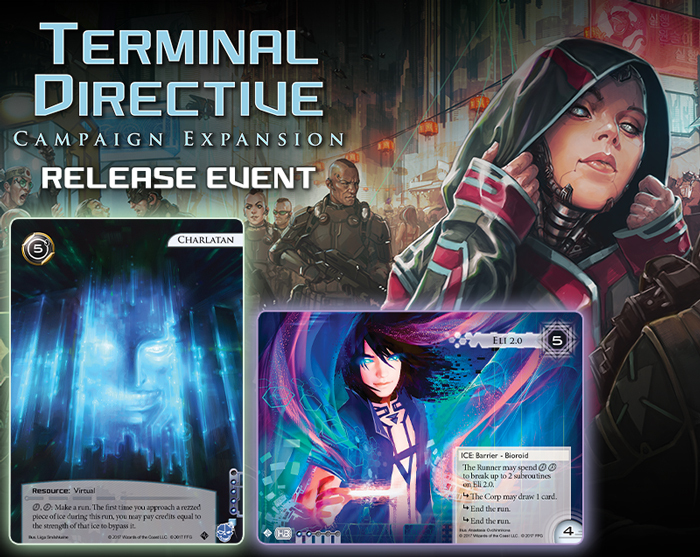 So head to your local retailer today to pre-order your copy of Terminal Directive and talk to them about hosting a Terminal Directive release event!